Celebrated kung fu yarn set during the later Ching years and charting the adventures of a Robin Hood style superhero named Iron Monkey (Yu Rong-guang), whose concept of helping the poor by stealing from the rich doesn’t bode too well with the corrupt authorities who name Iron Monkey as China’s most wanted criminal. Behind the masked vigilante’s disguise is Dr. Yang, a highly respected herbal doctor whose latest patient is a preteen Wong Fei-hung (played by a young girl, Tsang Sze-man). Fei-hung is the latest victim of a cruel governmental attack which sends his father, Wong Kei-ying (Donnie Yen), on a mission to uncover the true identity of the notorious Iron Monkey. Tsui Hark’s frenetic approach matches Woo-ping’s style of camerawork and choreography, who links together a series of highly charged wire-fu sequences performed by the best in the industry. 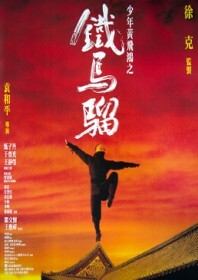 Great examples include a zany showdown with the movie’s real enemy – an unstable Manchu leader (Yuen Shi-kwan) – whose extendable sleeves and crippling King Kong Fists are met with the might of the elder Wong and Iron Monkey in a final kick-fest beset by burning poles and soaring embers. And if this sounds incredibly lighthearted, that’s because it is.